Due to the increasing demand for eco-friendly cosmetics, the cosmetic industry is focussing on the formulation of surfactant-free emulsions. 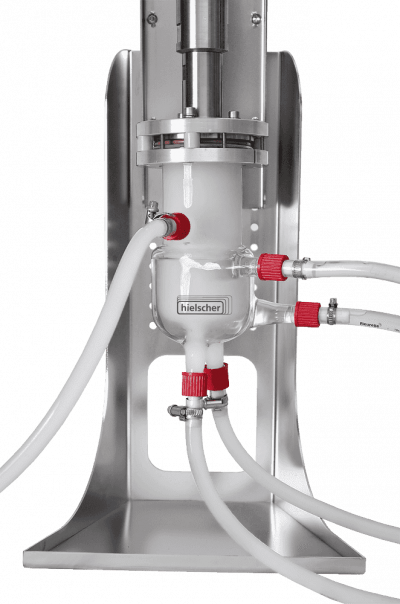 Pickering emulsions are surfactant-/emulsifier-free w/o- or o/w-mixtures stabilized by particles. Ultrasonic mixing and emulsification is an excellent technique to formulate highly stable surfactant-free Pickering emulsions. Powerful ultrasonic shear forces allow to prepare stable, surfactant-free Pickering emulsions using micron- and nano-particles as stabilizer. Sonication is a non-thermal emulsification process that is already widely used to emulsify w/o-, o/w-, and w/o/w-systems to produce stable emulsions (e.g. for moisturizers, creams, lotions, sunscreens, ointments etc.). Clays and clay-based products show good results a stabilizers in Pickering emulsions. 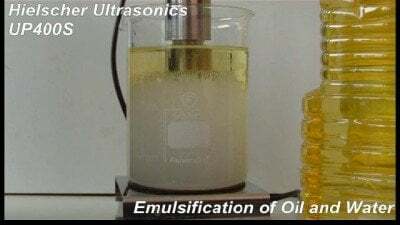 The high shear forces of ultrasonic emulsification enables to mix even rheology modifiers, which are normally hard to disperse such as clays and clay-based products into cosmetic formulations. The big advantage of clays is their dual function since they stabilize the emulsion and simultaneously act as rheology modifiers in the formulation. This means that sonication is an excellent method to formulate even cosmetic emulsions with shear-thinning characteristics which are also thixotropic and offer thereby good application characteristics (e.g. easy application to the skin, sprayable products etc). The continuous phase consists in a water – laponite® dispersion, the internal/dispersed phase consists in castor oil. The continuous phase is prepared by dispersing 2wt% laponite® powder in 0.1M NaCl (in ultra-pure water), dispersing by using Hielscher’s ultrasonic homogenizer UP200St or UP200Ht (200W, 26kHz) for a few minutes minutes. For the o/w-emulsion, the oil is gradually added using a pipette to the aqueous phase, whilst the mixture is sonicated. After approx. 2 minutes of sonication, a homogeneous and stable emulsion is formed. During the emulsification procedure, the sample is cooled in an ice bath to prevent heating of the sample. To form an emulsions with a lower volume fraction, the original emulsion (φ = 0.70) can be diluted with 2wt% laponite® powder in 0.1M NaCl. 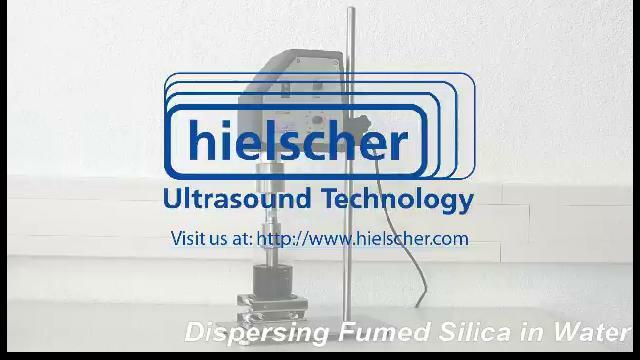 For the preparation of larger volumes, Hielscher supplies for all lab and industrial ultrasonicators special flow cells, which allow to disperse/dissolve both, the powder and oil droplets into a nanoscale emulsion. Read more about the ultrasonic preparation of Pickering emulsions! Tabibiazar, M.; Davaran, S.; Hashemi, M.; Homayonirad, A.; Rasoulzadeh, F.; Hamishehkar, H.; Mohammadifar, M.A: (2015): Design and fabrication of a food-grade albumin-stabilized nanoemulsion. Food Hydrocolloids 44, 2015. 220-228. Most skin care products represent a mixture of two or more substances that are not miscible with each other. This means that they are in accordance to the second law of thermodynamics inherently unstable. To form a stable mixture from these immiscible materials, the use of stabilizers is required to prepare an emulsion with an appropriate shelf life. Ionic or non-ionic surfactants are commonly used as emulsifiers. For skin care products, the use of low molecular weight, amphiphilic surfactants often causes intolerances of cosmetic products with sensitive skin. Furthermore, a growing number of consumers is demanding for natural, clean cosmetic products. Such products are reduced mostly to the active ingredients, which nurture the skin, and are mostly free of additives (e.g. emulsifiers, fragrances etc.). Surfactant-free / emulsifier-free emulsions are a desirable alternative to conventional cosmetic formulations. Pickering emulsions are based on the use of biopolymeric emulsifiers or solid particles as stabilizers in order to create stable cosmetic products with pleasant product characteristics. 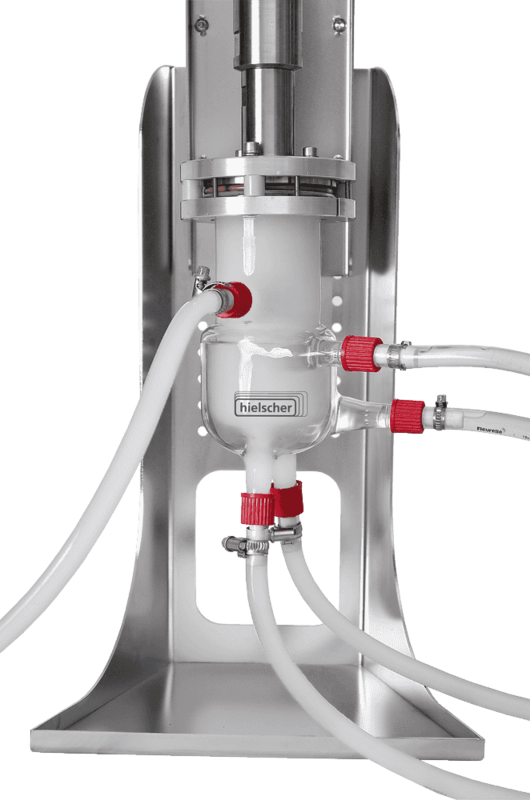 Ultrasonic emulsification is an excellent tool to prepare stable nano- and miniemulsions as well as Pickering emulsions. Furthermore, sonication is applied to various other applications during the production of cosmetic products such as the dispersion of pigments, dissolving of powders, or extraction of active ingredients. An emulsion is a two-phase system. The principal components are an oil phase and an aqueous phase. The aqueous phase is water plus any combination of materials which are polar and dissolve, at least to some extent, in water. The oil phase comprises one or more oily materials, or other ingredients which are nonpolar and exhibit at least some solubility in oily materials. Oil-in-water (o/w): oil droplets dispersed in water; the oil is referred to as the internal or dispersed phase and the water as the external or continuous phase. Water-in-oil emulsion (w/o): water droplets are dispersed in oil; the water is the internal or dispersed phase and the oil the external or continuous phase. w/o/w or o/w/o are so-called complex or multiple emulsions. Laponite® is a synthetic smectic clay, which forms a clear, thixotropic gel when dispersed in water. The pH value of a 2% Laponite® suspension is around 9.8. A gel is formed at 2% concentration.